“I believe that a Mayor with direct ties and a clear vested interest to the success of the City’s residents and businesses is the ideal candidate for such a role. I am willing to take that charge and to be accountable to you,” Carlton Simmons said ahead of this week’s election. Mr. Simmons is running against Charles Gosling for the position of Hamilton Mayor, with the Municipal elections set to take place this Thursday [May 7]. “I believe that a Mayor with direct ties and a clear vested interest to the success of the City’s residents and businesses is the ideal candidate for such a role,” Mr. Simmons said. Mr. Simmons said his election vision for the City of Hamilton includes measures such as actively working with Government and cruise liners to create a full season of cruise ships for the City; have a comprehensive review on parking to ensure that parking throughout the City is fair and adequate for all residents, business owners, taxi operators, and persons visiting the City for commerce; create better berthing facilities in Hamilton harbor; increase safety within the City; create incentives for new business to enter the City and more. The 2015 Municipal elections will take place this Thursday [May 7] and will see voters head to the polls in both Hamilton and St George’s. Mr. Gosling is set to run against Carlton Simmons for Hamilton Mayor, while the east will see Quinell Francis, Alfonso Harris, and incumbent Garth Rothwell running for St. George’s Mayor. Voters will also be selecting Municipal Residents’ Councillors in Hamilton, choosing between John Holdipp III, Henry Ming, Carlton Johnson, George Scott, Aaron Scott, Derrick Phipps, and RoseAnn Edwards. There will not be an election for Business Ratepayers Councillors for the City of Hamilton, as there were only four candidates, including John Nicholas Swan, Lawrence Gordon Scott, John Harvey, and Dennis Tucker. In St. George’s, the Business Ratepayers’ Elections and the Municipal Residents’ Elections were also uncontested. 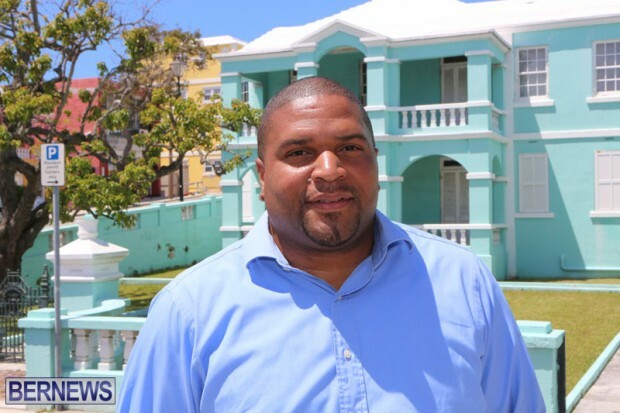 Philip Seaman and Faith Bridges are the St. George’s Business Ratepayers’ Councillors, while the Municipal Residents Councillors are H. Anthony Richardson, Wilfred Bean, Phillip Anderson, Eakin McLaughlin, Elizabeth Christopher, and Jamie Sapsford. I am Carlton Simmons Jr., the second youngest child and only boy of four siblings. I have been a resident of the city from the age of 8 years old. I am the proud father of my two lovely daughters aged eleven and twelve years old. After graduating from Northlands Secondary School in 1995, I had the honour of winning the BELCO scholarship. I was one of 3 individuals chosen from 300 candidates for BELCO’s four year apprenticeship program. I attended York College in England where I received certifications in Electrical Engineering and in 2005 I was awarded a BELCO long service award for 10 years of continuous service. My passions include Entrepreneurship, playing chess, and Community Activism. I purchased a home in Hamilton at the age of 22 years old. I co-founded “Youth on the Move Bermuda” in 2008 and I am the co-owner of several local businesses, all located within the City of Hamilton. I have served as an Alderman on the City Council for the past 3 years. Although the journey has had its challenges. I have learned valuable lessons with regards to politics, the City’s affairs, and it’s day-to-day operations. The most significant lesson is undoubtedly that integrity and good governance is of vital importance to this community to the role of Mayor, and collectively to the people of Bermuda. I believe that a Mayor with direct ties and a clear vested interest to the success of the City’s residents and businesses is the ideal candidate for such a role. I am willing to take that charge and to be accountable to you. With your help, I know that I can effectively and efficiently serve the City of Hamilton and all who enjoy what this City has to offer on a daily basis. 1] Actively work with Government and cruise liners to create a full season of cruise ships for the City. 2] Have a comprehensive review on parking to ensure that parking throughout the City is fair and adequate for all residents, business owners, taxi operators, and persons visiting the City for commerce. 3] Create better berthing facilities in Hamilton harbor [including onsite fresh water, electricity and fuel] to increase international marine traffic. 4] Create a log for suggestions, complaints, and inquiries to ensure that public concerns and comments are captured and addressed in a timely manner. 5] Increase safety within the City. Address vagrancy, homelessness and security measures throughout the City. 6] A complete review of City expenditure. Identify ways to conserve costs and increase revenue without additional taxes. 7] Create incentives for new business to enter the City. 8] Create a rate payers ‘bill of rights’ to reflect the full list of services and standards that they should expect and are entitled to from the City and its employees [i.e. reasonable lighting, clearly marked street signs, safe work sites and practices by city workers and contractors working within the City, timely repairs to streets and infrastructure, informed and professional staff, efficient service delivery, etc.]. 10] Perform a comprehensive review of the City’s organizational structure to ensure that it adequately and efficiently meets the current and future needs of the City. 11] Work to bring the city into one likeness through ensuring safe, clean sidewalks and roadways. Identifying and restoring derelict infrastructure and facilities throughout the city and issuing stronger regulation for regular maintenance of others is significant. Trash will be picked up throughout the city in a timely manner, trees and other botanicals will be evaluated and beautified where necessary. 12] Reintroduce the City apprenticeship program for young people. Create jobs and opportunities where young Bermudians can develop and learn a trade. Introduce more training for existing staff to gain certifications and enhance their skillset. 13] Use existing properties to facilitate new and affordable housing developments such as #6 & #10 Dundonald Street. The City should be a preferred place for living without any questions for safety and security. Grow the City of Hamilton by introducing fresh and innovative concepts. Likewise with many other great cities, the City of Hamilton will become more colorful and vibrant through modernization of public spaces. Local artistic expression of our culture and heritage can revitalize select buildings and structures, the development of organized chess parks can unify generations and like-minded enthusiasts. A state of the art city playground, a skateboard park for the youths, and a recreational facility including an indoor play area and basketball courts fostering a safe, drug-free environment will provide the young people with age-appropriate entertainment and allow them to also invest value in this community. The City has a rich history and it must be sustained for future generations. Together, the City of Hamilton and the Government can both serve the country in the best interest of Bermuda and its people. Carlton…all this drama unfolded under your nose! Now you want to be Mayor? The more these guys interrupt the status quo of old Bermuda the more we see how things used to be. So who was it that sat down at the press conference with the Mayor from the US to assure the public that everything was fine with the Black Mayors Conference? I believe that was you Mr. Simmons. If you can be duped into supporting what was clearly a sham to begin with then you have no business being the Mayor. All other issues aside….and there are many….this is the one that proves that you are not qualified for the job, at best. Mr Simmons you had the opportunity to prove yourself in the last Municipal debacle. The city of Hamilton administration needs a fresh start. I am afraid you should not be part of it. What was that fiasco that you and Mr. Smith were involved in removing traffic signs, most unbecoming to the behavior of a Deputy Mayor and an Alderman. I sure hope the Harbour Light residents sleep through this voting period!!! the election vision reads well. the trouble is the pesky old sayings which say, “He who walks through a field of onions, will smell like an onion” or,”Show me your company and I’ll tell you who you are.” well, you sure showed me. “affordable housing developments such as #6 & #10 Dundonald Street” I think this is a misprint or a joke. I wouldn’t trust Mr. Simmons to run the 24th of May 1/2 Marathon Race let alone help to run the Corporation of Hamilton. Surely the last few years have taught the rate payers that much. Wasn’t he one that complained that he never realized being on the Corporation of Hamilton would involve so much work and was one of the first to agree to having a salary??? No thanks Carlton Simmons, you had your chance & you messed up big time umpteen times! Mayor Gosling is the better choice! I wouldn’t vote for this guy if it was a one man race. Candidate Simmons walking in the foot print of the greatest advocate of city reform-W E R Joell.